As the 2018 O'Reilly Auto Parts Friday Night Drags season winds down, drivers frantically search for any opportunity to pick up ground on their fellow competitors. With only four races remaining entering Friday night's action, Wayne Harris and his 1968 Chevrolet Camaro looked to regain the points lead in the Harbin's Mechanical Services Street Outlaw Division. In the final run of the night in the division, it looked like Harris was beat as he was slow off the line. Harris knew what he was doing and after he hooked up with the track, was able to shift gears and drive past the 2017 Chevrolet COPO Camaro of Mike Moore of Peachtree City for the win. "Every time we've run against each other this year, I've had his number," said Harris. "I turned it down off the line so I could hook. I ran him down at the end of the strip. When I changed gears, I just went by him." 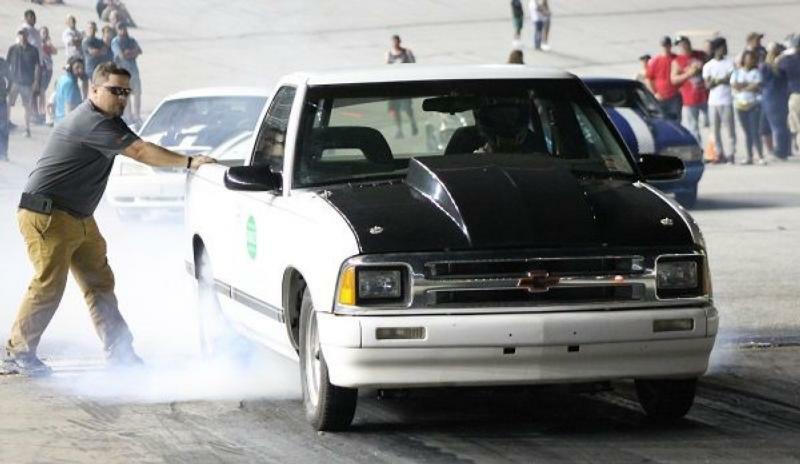 While the Street Outlaw Division is separated by fewer than points, Brandon Sampler along with Jody Scott have piloted the 1995 Chevrolet S-10 to a dominating performance this season in the Street Performer class. "Tonight went really well, it was a good night," said Scott. "The truck is doing really well. Had a pretty hot burnout earler tonight and the tires aren't sticking as well as they normally do, but overall it was enough for the win." Scott was also able to pick up the Peach Pass Burn Out Zone win as well as a used his first round bye to burn down his tires and post the best smoke show of the night. "Right before I pulled up to the burnout box, one of the track officials walked up to me and said 'put on a good show, you are in the burnout contest tonight' so it went well," said Scott. "It was a good burnout. The truck felt good and we had a good night." While Scott was burning down his tires, Steve Schaffer of Newnan and his 2018 Chevrolet Corvette found victory Lane for the first time in the point season in the New Edge Division. Schafer took out the 2007 Corvette of Jordan Wesley of Williamson in the final round for the win. ATV/Jr. Dragsters: Gracie Haralson (Hampton); 2005 Mov. Tub Jr.
Atlanta Motor Speedway's O'Reilly Auto Parts Friday Night Drags & Show-N-Shine returns to the pit lane drag strip next Friday, Aug. 10 and features the Pro Bike Challenge with Nitro Bikes taking on the Pit Lane Drag Strip. Grandstand gates open at 6:30 p.m., and nightly drag race eliminations start just after 9:00 p.m.